Adult summer camp? Yes, please. Summer camp is great: the art projects, the dances with the girls camp across the lake, the making new friends you swear you'll keep in touch with when it's all over, until you realize they're from Arizona (but you'll always have the art projects). Giving you the summer camp experience all growns up, Hicksville Trailer Palace, taking reservations now. Built by a crazy/creative indie film director, Hicksville's a Joshua Tree trailer-park motel catering to people who miss summer camp/love themes, with an Epcot-worthy bevy of differently styled trailers, all sorts of retro campy activities, and even a little pool, which you'll no-doubt squander by picking Villanova. 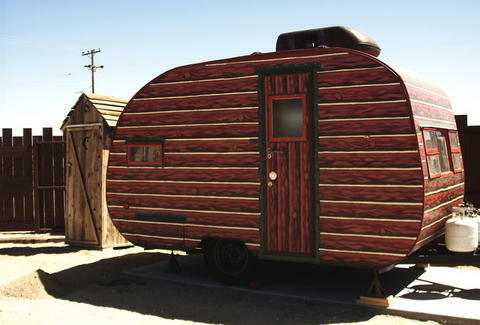 Thankfully, bunking up's not in huge dorms, but rather the aforementioned rentable trailers, each with their own distinct flavor: the Pioneer's all westerned-out, with an interior that resembles a log cabin w/ rope trim and a wagon-wheel table, as well as an attached outhouse w/ a working urinal; the Lux's a gothic ode to the horror-rock band The Cramps (obv), w/ a jukebox playing songs that inspired them and a black & white TV exclusively showing monster-movie classics, and the Integra's an Airstream ode to aliens, with a fog machine and an "alien communication system" with knobs and levers to connect with extraterrestrials, the effectiveness of which "depends on your state of mind", so don't you dare watch Rachel Getting Married before you check-in. To make sure you're not spending all your time inside, they've got nostalgic activities like archery, ping pong, horseshoes, and even a BB gun range, though sadly they've discontinued their BB King range, citing that "the thrill is gone". If arts & crafts are more your thing, Hicksville's also got a trailer that converts into a film-editing suite and an on-property recording studio, perfect for another campy experience: you, trying to be creative.